India is located in Southern Asia, bordering the Arabian Sea and Bay of Bengal, between Burma and Pakistan with an area of over 3,287,270 sq km including territorial sea. It has land cover over 2,973,190 sq km. The land mass boundary is about 15,200 km and coastal line is about 75,166 km Mainland, Lakshadweep and Andaman & Nicobar. India has plain in south, flat to rolling plain along the Ganges, desert in west and high mountains in north. Kanchanjunga is the highest peak of height 8598 m in the north. After attaining independence on 15th August 1947 from colonization, India emerged one of the fastest developing countries in the world. India rank seventh largest country in area and second in population. It has the largest democracy in the world. India framed a constitution and declared itself a Republic on 26th Jan 1950. The constitution ensured the trinity of justice, liberty and equality for the citizens of India. Adopting the path of democracy, the country held its first general election in 1952. Elections to the lower house of parliament, lok sabha, have been held regularly every five years. India has a parliaments form of government based on universal adult franchise. The executive authority is responsible to the elected representatives of the people in parliament for all its decision and actions. India is a union of twenty-eight states and seven centrally administered union territories. The colonial rulers in India initiated revenue surveys two century ago, which was based on the systems adopted in England and Western Europe. This survey was started with a view of collection of revenue for estates. Survey of India as a department of government of India establish in 1767 was fully involved in the process of revenue surveying till 1904. In 1904, each states of India were made responsible for cadastral surveys. Each states has evolved their own way of legal system of cadastral survey for revenue collection. The process of cadastral survey in India has not yet taken full advantage of modern technology available in surveying and mapping. As a central govt. organization, Survey of India was involved in cadastral surveys in India from its inception to till 1904. After that, the responsibility of cadastral surveys was assigned to state governments. However, survey of India is providing technological know how to state government in the matter of cadastral surveys. Each state is adopting their own methods of cadastral surveys and mainly emphasis is given to the legal aspects, which are connected with rights, khasara, khatauni etc. Most of the cadastral surveys in India are undertaken by the state government department. The private sectors are now being involved for generating GIS and LIS for better management of land resources. There are professional organizations in India, which are involved in surveying and mapping. Survey of India is one national mapping agency in the country to provide topographical maps for entire country on various scales. The department is also generating land information system for the states on demand basis. There are other organization which are assisting state govt. for developing LIS/GIS like NRSA, NIC, SAC, IIT’s etc. Institute of Surveyors is one major association in India having Institutional members in the field of surveying and mapping. There is no concept of licensing and registration of cadastral surveyors in India. In fact the government surveyors of state/center are carrying out all the cadastral survey. Survey programs are offered at all Indian university in 4 years bachelor degree of civil engineering. There are postgraduate level study in geoinformation and surveying in few selected universities in India. Beside, Survey of India has got Survey Training Institute where various level courses are run in surveying and mapping for the departmental officers and staff, state/central government sponsored candidate and private students. Trainees from neighbouring countries are also getting training in the Institute. The course for surveying and mapping, GIS/LIS, digital mapping, printing and modern technology are run in the institute. The Cadastral systems in India were designed initially to earn revenue through collection of taxes on property. The cadastral surveys are important because invariably these surveys are linked with ownership of the property. The cadastral systems support the legal ownership of the land, depiction of legal and topographical aspects including area and parcel boundaries. Depiction of legal & topographical aspects of the land becomes more important if it pertain to urban/town property. Due to fast development activities, the system plays important role in land administration activities by policy makers, resource planners and administrators who make decision about the land. They need detailed land information than has been traditionally available. 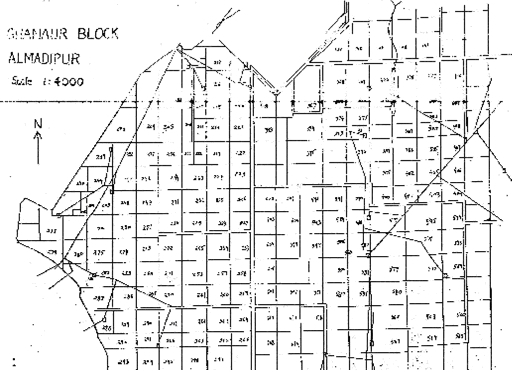 In India, the basic unit of the cadastral record is the land parcel, which is known as plot. The plots are registered in the name of the owner defining plot boundaries. Maintenance of land records with ownership; assessment of tax on the property and collection of tax is the responsibility of district authorities. The cadastral surveys are conducted periodically to locate and demarcate land boundaries on ground and map and than to facilitate management of land parcel information. Land records in India consist of cadastral survey and mapping, recording cadastral information, land evaluation and planning. Cadastral system in India relating to land and land dispute comes under the charge of Tahsildar, Kanoongo and Patwari (Lekhpal). Each district is divided into tahsils and every tahsil comprises of pargana and villages. The classification of agricultural land, its measurements, the assessment and its produced are properly maintained in the land record register. Map of land parcels linked to other records describing the nature of the rights or interest in the respective parcels. The cadastre is managed by the state government. Generation and maintenance of the cadastral records is different in different states. The current cadastral maps in all sates and union territories are usually based on a graphical representation. These maps are not following any systematic scale or datum. During the last decade, India has started computerization of land records of the country by storing the records in file-based database. The rapid pace of development in many cities, necessitate planning for an effective land information system for utilization of its resources for development while at the same time protect the environment. There is a need to have accurate large-scale maps in digital form for generation of GIS/LIS. In India mapping is being performed by Survey of India. The maps on scales 1:50k are available with SOI for entire country. Large scales maps are also being prepared by SOI for some areas on demand basis. One example vector map of digital database is given below for cadastral application generated for a part of Ghanaur block of Punjab using GPS and GRAM++ software. The cadastral graphical map obtained from revenue department and was scanned and georeferenced using GPS control points. All resources available on ground were picked up through GPS survey and transferred to database. Tabular data i.e. names, facilities like buildings, tube wells, schools, religious places roads and other facilities were incorporated in data base. Developmental activities in the country necessitated the accurate information about the lands and updated inventory of the county resources. With the revolution in IT industry, land information system or cadastral system which provide the knowledge about the lands comprised in country, state or region is becoming the demands of the day. Spatial Data Infrastructure is one of the solutions to meet the needs of the nation because of its capability in identifying the key factors that facilitate development through better understanding the complexity of the interaction between social, economical and political issues. Main objective of SDI is to disseminate, utilize and manage spatial information for all activities related to land and its resources. The unsystematic land survey and land records are the major issues for proper management of land. The administrators, planners and decision makers feels that one of the major factor for delay in execution of land related projects is the lack of information. Availability of modern methods of surveying and mapping required to be adopted for generating a uniform system of maps and to be associated with the land records available in the country. There is a need to identify and adopt appropriate technology for collecting cadastral data. Computerization of land records and their updating in a consistent format is also needed to make macro planning. Establishment of a system to develop HRD strategy and institutional arrangement in support of national LIS are required to be framed. In addition to this, there is need to create standards at national level for cadastral surveys, equipment, methods, data measurement, data structure, scale, accuracy, symbology and data exchange format. Cadastral map data base to be integrated with national datum so that the individual land parcel and the rights of the land holders in the parcel get prime focus in all developmental activities launched by the government. Since the first five years plan in the country, planners had been advocating proper maintenance of land records, which are the basis of good administration aimed at social justice through better implementation of rural development programmes. During 7th five year plan it was decided that” the land records form the base for all land reforms measures and, therefore, regular periodical updating of land records is essential in all states. This will necessarily have to include scientific survey of unmeasured land and recording of rights of tenants and share-croppers which have remained unrecorded until now”. This activity will require adopting latest information technology for quicker storing, processing and retrieval of information database in land records. During the last decade NIC has started computerization of land records of the country by storing the records in simple file based database. Processing these records in RDBMS GIS packages further enhanced this process. During the new millennium the data will be processed in GIS environment. Other govt. organizations like state govt. now being involved to develop land information system for sustainable development of their states and country. Such projects are being take-up by DST, IITs, and NIC etc.